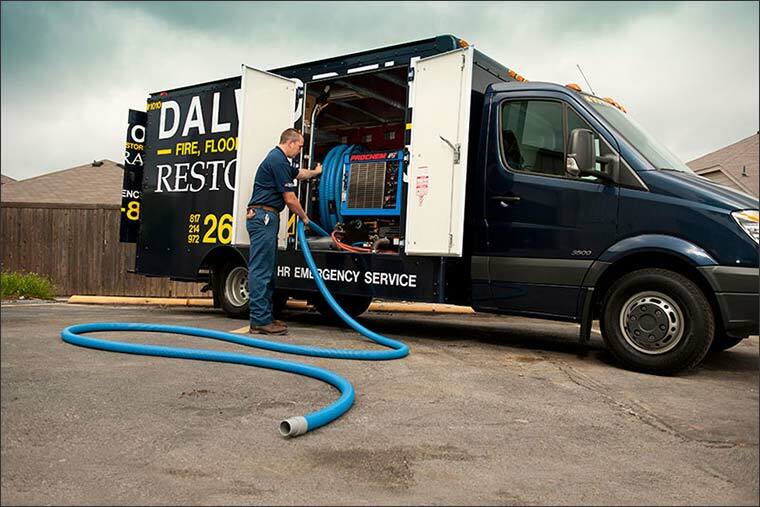 Dalworth Restoration is a full service water damage cleanup and fire or smoke damage restoration company in the greater Dallas-Fort Worth Area including the Arlington area. Dalworth has been in business in the DFW Metroplex since 1976 with a dedicated focus on excellent customer service, which has made Dalworth a household name in Arlington, TX. This is why insurance companies also prefer Dalworth Restoration for disaster cleanup services. When water damage occurs to your Arlington home, whether it's a catastrophic storm or a disastrous plumbing leak, you want to call an restoration company immediately. However, not all restoration companies are the same. If you are looking for one with fast 24/7 response, state-of-the-art equipment & techniques and, more importantly, a commitment to caring, Dalworth Restoration is your choice. Our water damage and restoration professionals are certified, bonded and insured for your security and peace of mind. Contact Dalworth Restoration for your water damage restoration, water cleanup and removal or disaster cleanup services in your Arlington home. Dalworth Emergency Restoration Crews are available 24/7 to extract water, remove debris, dry out and repair your residential or commercial property quickly. Call us at 817-203-2944 if you have had a water loss and need assistance. We will dispatch our certified technician(s) to your home or office to resolve your water damage using our state-of-the-art drying equipment. Everyone we dealt with was very helpful, professional and friendly. We would definitely recommend your services to others. A water damage restoration project was successfully completed in Arlington, TX last week by Dalworth Restoration. Dalworth Restoration Deflood recieved an Emergency Service call from a client, Lavenda G , in Arlington TX. She had a Toilet overflow in master bathroom of her home. Fanny Z. from Arlington, TX Says Everything Was Amazingly Wonderful! It was a relief to hear a live person on the other end of the call the day I had the incident. I didn't know what to do and they walked me through it. Carole B. from Arlington, TX, Says Thank You So Much For Excellent Service! Water damage restoration services in Arlington, TX since 1976. Emergency 24/7 flooded bathroom drying, cleanup, and repair. Dalworth Restoration completed another successful water damage restoration project in Arlington, TX. We had water flood into our house during the recent rains. Leaking faucet in utility room caused water leak onto carpet in den. We had our upstairs bathroom toilet overflow during the night. The carpet(approximately 3X4 feet) is wet. It leaked down through the downstairs restroom ceiling. It seems to be a small job. We are just needing a ball park estimate to see where we need to get started. Water damage in master bath and adjoining spaces from roof leak. Need est on removal of damaged materials, and a proposed plan. I'm looking for continuing education classes. Are you offering any? Wants a pack out to re-do his floors. We experienced small flood from a backed up HVAC line. Area directly around drain is soggy.